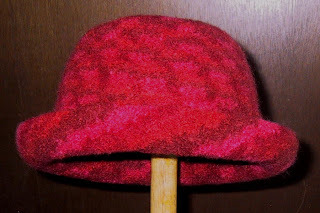 This crocheted and felted roll brim hat can be worn three ways: Roll Brim, Snap Brim or a Bucket. Note: To make a crocheted in “band” crochet rounds 24-26 in contrasting yarn. Rounds 29 to 32: Ch 1, 1 hdc in each stitch around. Join. Put the crocheted hat into a zippered pillow case. This is necessary to protect the pump in your washing machine. Put the bag and a couple pair of old jeans into the washing machine on “hot” cycle, small load, fastest agitation. Add a very small amount of liquid dish washing soap (not dishwasher soap). Let the machine agitate the hat for 10 minutes. Stop the machine and check the progress of the hat. If it’s still too big, reset to the beginning of the wash cycle. Recheck it every 5 mInutes as it can felt in a hurry at this stage. Don’t let the washer spin. It takes 16 minutes in my washer. But times vary by machine and water temperature. Remove the hat from the machine and rinse the soap out in a sink. Squeeze as much water out as possible without wringing. Then wrap in a towel to absorb excess water. Then shape it as you desire. You can use a bowl a mannequin head or your own head. Don’t laugh the first one I made that’s what I did. Now I have the perfect flower pot. Allow the hat to air dry. Trim any loose ends. Should the yarn be worsted weight or bulky? Worsted weight. I'll change the materials list, thank you. Can this be done in a front loading washing machine? I have no experience with a front loader. I have seen people post about felting in a front loader though. Good luck. Here's a good site that explains the abbreviations and stitch instructions. Thank you for posting this pattern! It was very easy to follow for a beginning crocheter like me (started about a week ago). I change it a little bit to fit my head (I continued putting 2 hdc in one stitch up to 13 hdc in between), and in the end I pinched the top to make it kind of fedora-ish. My wife's family thought I bought it at a store! My wife is a little annoyed with my new hobby, but I love my new hat!!! Thanks so much again! Thanks for you pattern I need somthing to do and I wanted to felt a hat. I love this hat - I am just getting back into crocheting - can you tell me how much yarn this takes? 5.25 oz. is equivalent to ? yards/grams etc. Read the yarn labels, they should help you determine the imformation you are looking for. Did you make this using one yarn or two? Most felting items seem to use two. One strand, if it was two I would have stated that in teh pattern. My hat has finished drying now and I LOVE IT. I was worried because I usually end up with a product WAY larger than it is supposed to (Baby bonnets have fit the mothers.). When felted in the machine, it came out perfect. I have not worked with wool before so next time, I will NOT wash the dog and felt wool on the same day! Could you felt this by hand? I have a front loader and can't really stop the machine to look at it. People do felting by hand but I wouldn't try it. I have a front loader also. I cheated and wet my project in a bowl, removed the excess water, then put it in the dryer on high heat. just have to watch it and start with 10 min at a time. I want to make this hat. I love it. I'm using lion brand fisherman's wool. Is that yarn OK. This will be my first time felting a hat. Can I use any hat pattern also? 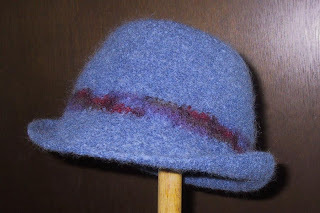 The blue hat was made with Fisherman's Wool. 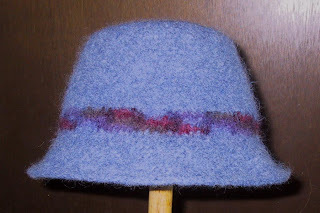 As far as using any hat pattern, I don't think so, a regular pattern wouldn't be large enough before to not be too small after felting. Thank you so much I'm on row 6 now! Don't be put off by how huge the hat gets. I am on row 10. There are little holes in between all the stitches. Will these go away once felted? The stitches need to be loose so that there is room for friction. As long as you are using a feltable wool and follow my felting instructions there shouldn't be any problem. I made many of them using Paton's Classic 100% Wool and all turned out perfectly. Thank you for this pattern.. years later :) Only thing I did different was I always start with a magic circle. How many stitches in an inch? I was told by some of my friends that the 'I' crochet hook looked too tight and might not properly felt. Time is of the essence since I need to have some ready in a few weeks. Thank you! I haven't crocheted one of these in a long time. But since there are 120 stitches on the last round and measured flat it is 18 inches stitches per inch should be about 3.33. When you felt it you should felt it long enough that there isn't any stitch definition. You need to find a bowl or pot to block it on as well. Where did you find blue Fisherman's wool? I only see it in nutural colors! I dyed the Fisherman's wool.